Everywhere you look, there’s a new company coming out with a brand-new bathroom cleaner that they claim can make cleaning this hardworking room at lot easier. The truth is, all you need for a squeaky-clean bathroom is a great line of products that all work together to get the job done. However, unless you’re willing to purchase a plethora of products to try, you’ll need to read reviews and do some research first. Today, we’ve done that for you. 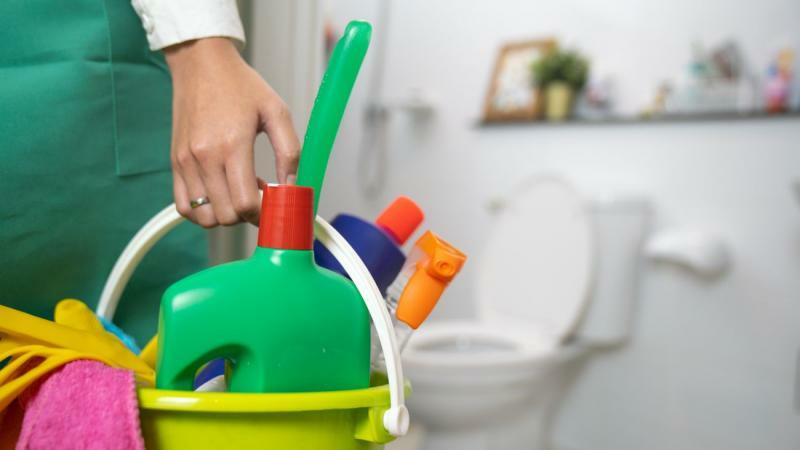 Here are the top five bathroom cleaners available today. The Honest Company is probably best known for its famous spokesperson and founder — actress Jessica Alba. You can buy their products online and in most major retailers, including Whole Foods. They also offer a subscription box model, which saves you from having to remember to reorder products if you use them often. Clorox is one of the biggest cleaning product manufacturers in the world. Their parent company, The Clorox Company, owns tons of different brands, including Burt’s Bees, Pine-Sol, and Liquid-Plumr. The Clorox brand offers products in tons of different categories, including laundry, kitchen, and bathroom. Their products are great for people who need to use bleach to feel like their bathroom is truly clean. This means many of their products contain bleach, but if you’re uncomfortable with this powerful ingredient, they do carry some bleach-free alternatives. Clorox Disinfecting Wipes: These easy-pull wipes are great to keep handy in case of spills or minor messes. Free & Clear Multi-Surface Cleaner: Bleach-free and made without perfumes and dyes. Bleach Foamer: A great product to use if you aren’t able to scrub aggressively because the foaming action does a lot of that work for you. The Swiffer product that you’re probably the most familiar with is their sweeper. They were one of the first companies to move this cleaning product to the “razor-and-blades” business model. People would invest a few dollars in an inexpensive sweeper handle, but the bulk of the company’s revenue comes from the refills. Since introducing their sweeper, they’ve expanded to other products, including dusters and air cleaners. Swiffer Sweeper Floor Mop: The most basic dry mop, which comes with dry cloth pads for quick clean-up jobs. Swiffer Sweep + Vac Starter Kit: A hybrid of a rechargeable, cordless vacuum, and cloth mop that catches dirt. Retailing between $13.49 and $44.975, these products are ideal for bathrooms, as the slim handle allows you to maneuver around close spaces like behind the toilet bowl and underneath the sink. Clean Magic Eraser Bath: A specialized version of their regular Magic Eraser that comes with foaming cleaner embedded into it. In addition to products that visibly clean your bathroom, Lysol also offers aerosol sprays that are able to kill both surface and airborne bacteria. This is great when you’ve got a sickness going around and want to make sure you’re keeping germs at bay. Whether you’re looking for heavy-duty cleaning power or are more focused on the environmental and health impact, there are lots of products out there that will work for you. A bit of research and trial and error will help you determine the right one for your family.